It has been a while since I have posted anything on my blog. And the pressure is on to entertain again! So let’s start with a recipe! I have a very good brownie recipe but I thought I would try something a bit different. Awesome brownie! The recipe comes from Taste magazine (it was a special top 10 brownies). 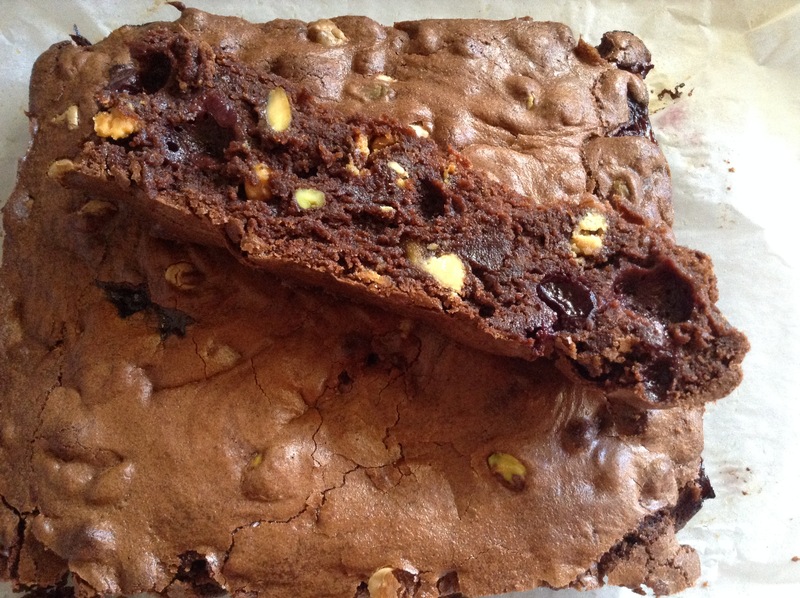 This is a classic chewy brownie recipe with added ingredients to make it deluxe! Preheat oven to 180°C/ 160°C fan forced. Grease a 20cm (base measurement) square cake pan and line with baking paper. Place butter and chocolate in a heatproof bowl over a saucepan of simmering water (don’t let the bowl touch the water). Stir with a metal spoon until melted. Remove from heat. Quickly stir in eggs, sugar, flour, cocoa powder, vanilla and salt until just combined. Stir through macadamias, white chocolate and raspberries. Pour into prepared pan. Bake for 50 minutes or until a skewer inserted in the centre comes out with moist crumbs clinging. Set aside to cool. I used salted butter and didn’t add the pinch of salt. I used normal cocoa powder. I didn’t have macadamias and raspberries. So I put in pistachios and a cup of frozen cherries. And I used small white chocolate bits. I cooked the brownie for about 1h10.